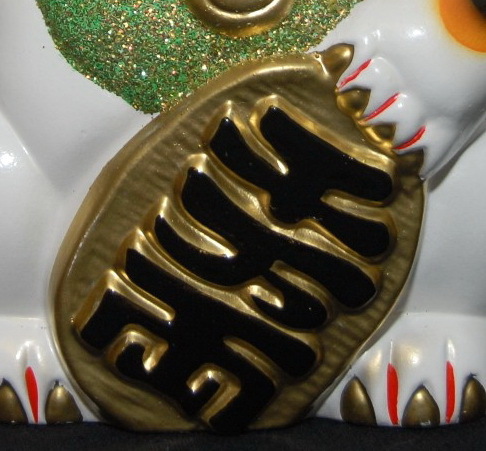 While the Beckoning Cat originates in Japan*, it has also become a popular good luck figure in Chinese businesses. Among these businesses, gold beckoning cats seem to be particularly popular (gold being associated with the desired wealth and prosperity of the business). 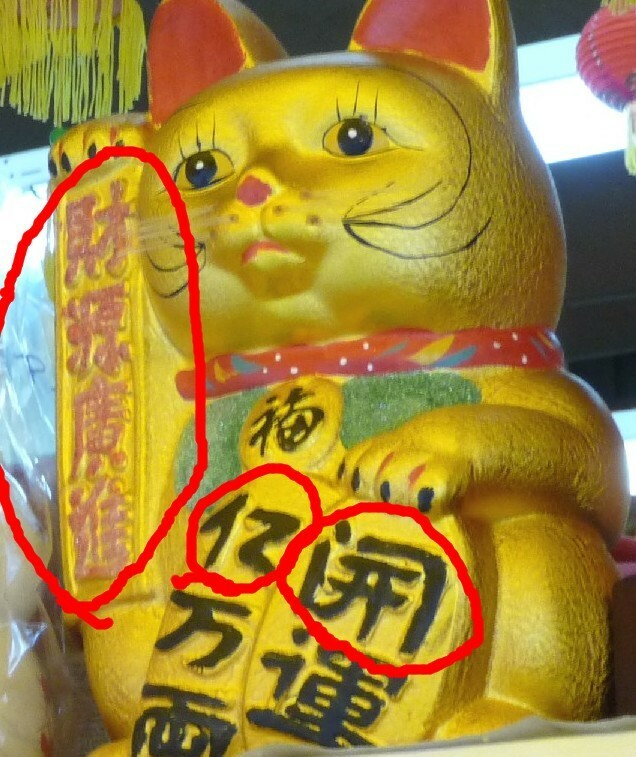 One of our blog readers pointed out the meaning of some of the writing on the coins of the Chinese Lucky Cat at left (see areas circled in red). On the cat’s right paw (to the left of the photo) is a typical Chinese phrase of hope for good fortune (something like “the source of money spreads widely”). The middle is billion in simplified Chinese (another reader suggests the Chinese character circled in the middle is “5” or “go” in Japanese, which means “50,000” when paired with the character underneath). Another reader suggests the character on the right (under the left paw) means “open fate/destiny”, or “kai un” in Japanese. Japanese kanji is based on Chinese writing, and the meaning of the writing on Japanese lucky cat coins is similar (readers of Chinese and Japanese, please feel free to verify or comment). Maneki Neko collector, Don Hargrove also provides some more info on the coins in his comment in our “About” section. 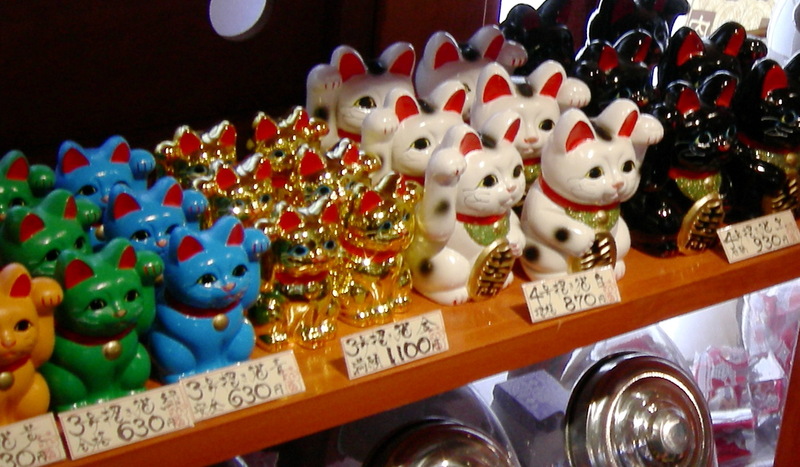 The kanji at right is quite common on Japanese Maneki Neko coins (the coin is called a koban). It reads “sen man ryo”, which means 1,000 X 10,000 ryo. So that is 10,000,000 ryo. A ryo is the name of a gold coin that was used in Japan in the Edo period, and 10,000,000 of them was a huge fortune at that time. * For info on the Japanese origin of the beckoning cat, see this earlier blog post.